Go west young man...like seriously go west now...right NOW!!! 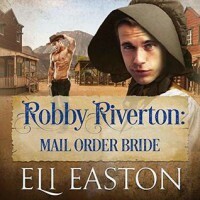 Not only is Robby Riverton: Mail Order Bride an historical novel, it's a western...probably one of my least favorite eras when it comes to books I read, but it's Eli Easton and I have to admit that was a big, big part of the draw for me. I also have to admit I tried reading the book and for me it was a bit of a struggle...this is totally a me thing. I was actually intrigued by the blurb on this one and I think that at another time it might have gone better but when the opportunity came up to listen to the audio book I was curious enough about the story to want to give the audio a sincere try so I decided to put on my big girl pants and get 'er done! and as you can tell by the fact that I'm doing a review...things went much better. Briefly Robby Robertson is an aspiring actor and things are going great until Robby witnesses a murder late one evening as he's leaving the theater putting him on the wrong side of Bowery Boys and making him a wanted man and not in a good way. So Robby does what any sensible young man would do...he runs!!! The only real question is has he run straight from the frying pan and into the fire. I actually ended up thoroughly enjoying this story. It had drama, humor, action, more than one plot twist and I quickly realized that things quite often weren't what they seemed with much of what was happening in this story which I have to admit kept things intriguing. As always Eli Easton has given us a cast of interesting and diversified characters to follow in this story. I really liked Robby, he was smart, considerate, kind and outspoken but yet he remained respectful of those who were helping him...unknowingly but still helping him all the same and I think at the end of it all Robby really did make the lives of those he met along the way a little bit better for having known him. Then there was Trace and for as awesome as he was Robby was someone that he needed in his life to make him see that not only could he be more than he was but that he both wanted and needed to be more. While reading this story seemed to be beyond my abilities and this is so much a me thing. Just to try and explain when I was younger and I loved to read, westerns just weren't my thing but if you ask me how may movies and shows I watched that were westerns...well, let me tell you, we're going to be here a really, really long time because even just listing television shows the list will be considerable...one of my absolute favorite shows was 'The Virginian' and there was also 'Gunsmoke', 'The High Chaparral', 'Bonanza', 'Dr. Quinn', 'Little House on the Priarie', 'Wagon Train', 'F Troop', 'Danial Boone', 'The Big Valley' and on and on that's right I watched them all and honestly I'm not even going to start on the movies...but as for my reading list I can safely say it really doesn't include any westerns. So I think I'm safe to say that for me it's more about the format than the genre and while I love a good western movie or even a television show for whatever reason books just don't work for me and this one right here it proof positive of that. I actually took a break from reading the book mostly because I just couldn't get into it. It's not that it's badly written or uninteresting because truthfully it's neither of those things and the fact that I was able to enjoy the audio book as much as I did I think speaks to that issue. So it turns out that when it comes to the e-book I sincerely believe this is a 100% me issue because I honestly enjoyed the hell outta' this one. It was funny, action filled, dramatic, had wonderful characters and the story was definitely unique and interesting...I'm just not a read them person when it comes to westerns and I have to wonder if I'd just listened to the audio book and not tried reading this one if my rating wouldn't have been even higher...I'm guessing it very probably would have. My recommendation is definitely give this one a try especially if you're an Eli Easton fan. I thoroughly enjoyed the audio book and I had the opportunity to check out a new to me narrator in the person of Matthew Shaw. I really enjoyed the voices that I got to hear for the different characters and look forward to checking out some of the other audio books narrated by Mr. Shaw...or at least the non-horror ones...I really and truly do not do horror stories but I am looking forward to enjoying this narrators interpretations of some of Eli Easton's other books...such as the 'Howl at the Moon' series. Ironically I'm pretty sure that 'Robby Riverton' is one audio book that I'll be enjoying again in the future...so while Robby Riverton: Mail Order Bride and I may have gotten off to a rough start I'm glad that I stuck with it to the end. An audio book of 'Robby Riverton: Mail Order Bride' was graciously provided by the author in exchange for an honest review.